You can use the old email address as well. The old blogs are bedded in the new website. “Seeing the Burren”, an exhibition of new work by David Skinner. Everybody welcome and meet the artist. 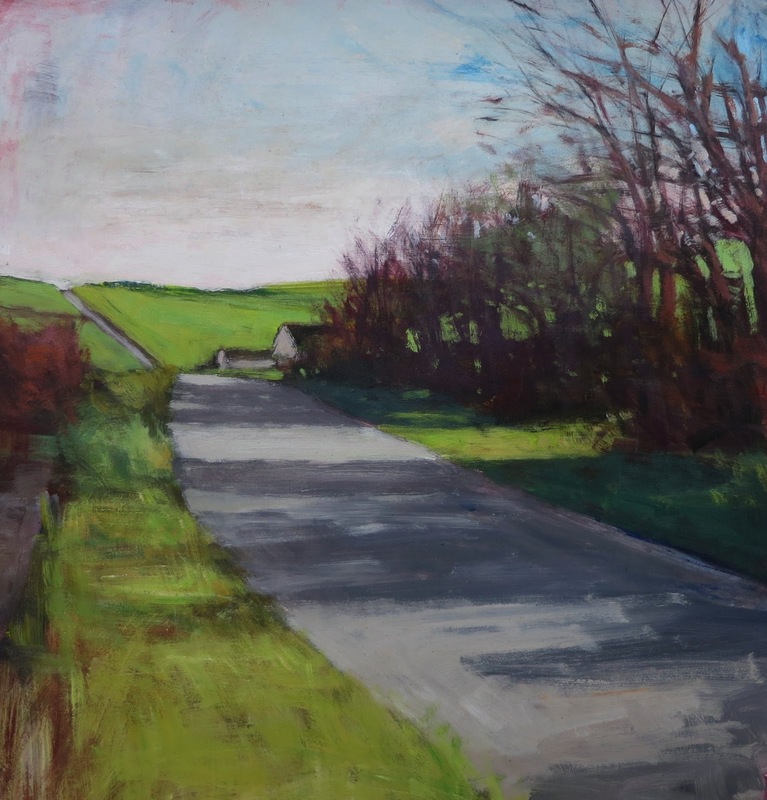 In the exhibition, David Skinner presents a series of landscape paintings that focuses on the Burren area of County Clare. Originally based in California, the artist is known for employing a bright palette and expressive brushwork in paintings that strike a balance between abstract and representational art. In this new body of work, Skinner draws inspiration from the unique light of the Irish winter, depicting the long shadows and vibrant colours that announce themselves once the sun has broken through the clouds. 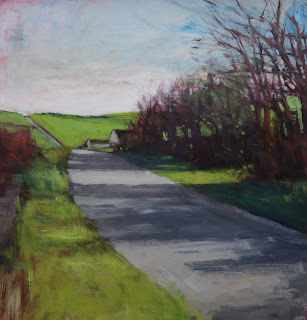 Since moving to Ireland last fall, he has been busy exploring the back roads of the Burren, taking photographs to use as source material back in the studio. The traditional cottages that appear in some of the works are referenced less as lodgings and more as shapes that the land accommodates. For this show, the paintings are primarily small works (25 x 25 cm), done with acrylic paints on watercolour paper. Seen together, these small paintings provide an evocative view of an intriguing and ancient region of Ireland. David Skinner is a Los Angeles-based artist who has exhibited extensively in the United States over the past twenty-five years in galleries and international art fairs. He is currently on a six-month art residency at the Burren College of Art and will exhibit his new paintings of Ireland in a solo show at the Elder Art Gallery in Charlotte, North Carolina, in the fall. Everybody welcome and meet the artists. The upcoming exhibition at the Courthouse Gallery, Ennistymon will show new paintings and drawings by Leonard Graham and John Cullen. Both artists work in an expressive way. Leonard Graham was born in Limerick and raised in Co. Clare. He graduated from Limerick School of Art in 2000 with a degree in fine art printmaking and a higher diploma in art teaching. 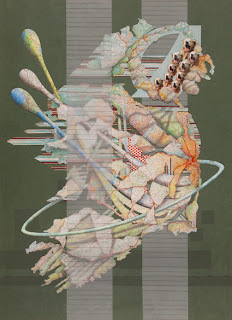 He has had a variety of solo and group exhibitions in Ireland, England and on-line. He also teaches art and design in Cork and is currently working on a graphic novel due in 2014. John Cullen's paintings are inspired by the distressed images of boxers’ faces. Through use of colour, composition and surface he tries to convey emotional states – courage, fear, anger, uncertainty, humiliation etc. “As such the paintings are metaphors for the state of humanity within the context of the current economic downturn”, he says. John Cullen was born in London and is resident in Ireland since 1995. He lives and works in Sligo. He graduated from Sligo I.T in 2009 with a degree in Fine Art. Since then he had various solo and group exhibitions in Ireland. I like to invite you to take part in a discussion organised during the closing reception of the exhibition CIRCUS EUROPE: an international collaboration of poetry & images, in the Courthouse Gallery, Ennistymon on 1st February at 7 pm. Artist Machteld van Buren from the Netherlands created the series of works titled ‘Circus Europe’ in 2012. The eight large collages illustrate how the struggle for survival is being waged various European countries. On the evening Machteld van Buren will start with a short talk about her work and will invite you afterwards to take part in a walk around the exhibition and to discuss the various works with invited politicians and the public. Invitees for this evening are: Michael McNamara, Timmy Dooley, Pat Breen, Johnny Flynn, Tony Mulcahy and Martin Conway. The idea behind Circus Europe is to strike a different note in the political debate through art and to give an alternative with a playful and visionary element, which might be actually quite useful. Rather than leaving it to politicians to define the Europe of today and tomorrow, it would be good to have artists depict it as well. Parliament Street, Ennistymon, Co. Clare. North facing skylights, architect designed lighting system, broadband and adjustable heating system, 24 hour access to building. Beautiful communal space shared with 4 other artists in the building. Rent includes electricity and heating. There is also a shared studio available to rent. THE HISTORY OF NORTH CLARE IN 100 OBJECTS. The very popular and successful series will recommence at the Ennistymon Courthouse on Wednesday 23rd of January at 8.00 P.M.. The series is not run in a strictly chronological order so there are always surprises at each session. Formal history in the traditional style very often overlooked the social and cultural life of a people. In this series there is a decided emphasis on the life and lifestyle of the people of North Clare. It is said every picture tells a story. We believe that every object has its own story,connections and associations. History lies all around us and we need to read it, not just in history books , but in our environment , folklore , ballads, family records and heirlooms. The Courthouse Gallery features a main art gallery and a smaller Red Couch Space. We are interested in exhibiting a wide range of visual art, including collaborations and multi-media projects for exhibition in both our gallery spaces. We also welcome proposals that are participatory led or involve some engagement with the community. We wish to focus on exhibiting emerging artists based locally and nationwide. Selection will be made in March and all artists will be contacted after that. Collages by Machteld van Buren (The Netherlands). 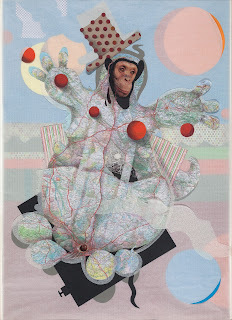 The series of works titled ‘Circus Europe’ are created by Machteld van Buren in 2012. The eight large collages illustrate how the struggle for survival is being waged in various European countries. Eight poets were invited to offer their interpretation of these images. The Irish poets taking part in this project are Jo Slade, Frank Golden, Jessie Lendennie and Patrick Chapman. The Dutch poets are Arnoud van Adrichem, Martin Reints, Lieke Marsman and Peter van Lier. Publisher Salmon Poetry, based in Co Clare, will publish a booklet of this project in an English edition. The collages are to be exhibited in both Ireland and the Netherlands. 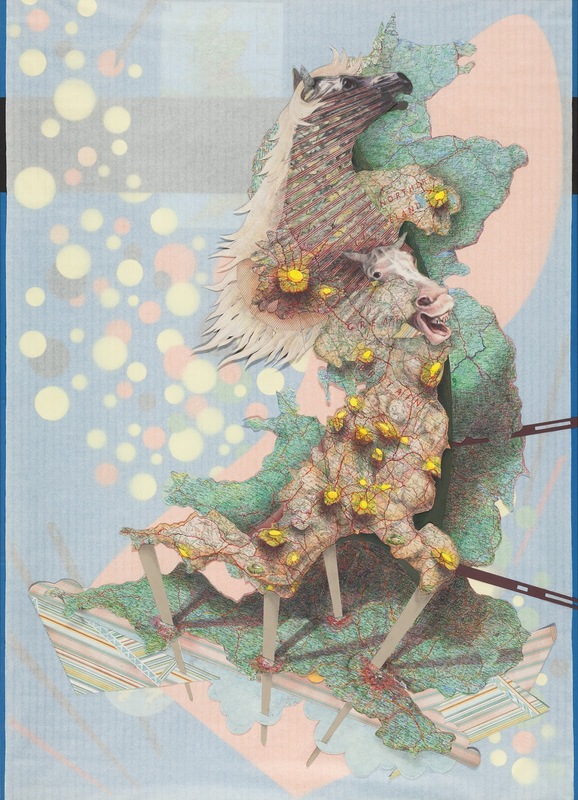 In this project she reflects on the tensions and uncertainties that exist in the present-day European Union which, although it is presented under the banner of a common flag, has always been a patchwork of independent nations. The current crisis has made it clear that a ‘United States of Europe’ is still a long way off. In the future, further disintegration is perhaps a more likely prospect than political union. The collages explore how the struggle for survival is being waged in various European countries. Most of the countries are depicted as an animal: the body consists of a map onto which the realistic head of an animal has been superimposed. Great Britain is portrayed with a number of horses’ heads, which form part of the landscape. The awkward juxtaposition of these figures suggests that the UK is not only struggling with its position within the EU, but is also divided by internal strife. Germany appears to be a bird of prey – not the traditional eagle, but a vulture. The juggling acts which these circus animals have to perform to keep themselves going are indicative of how each nation functions. But just how the stunts work is not entirely clear. Rather than leaving it to politicians to define the Europe of today and tomorrow, it would be good to have artists depict it as well. Given the tone of the debate, alternatives with a playful or visionary element might actually be quite useful. 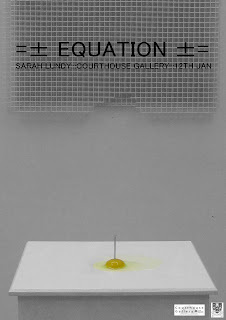 =± EQUATION ±= features an edited body of recent work by Clare based multimedia artist Sarah Lundy to be shown in the Red Couch space, Ennistymon Courthouse Gallery, opening 12th January 2013 at 4pm. Lundys work mediates purely formalist concerns and contemporary conceptualism. Through the use of moving image, assemblage of quotidian objects and ephemeral performance materials, the works endeavour to negotiate provocative arrangement and questions autonomy in the face of homogenization. Her practice involves the production of stoic visual accounts of the experience of the individual through consideration of the inevitable synthetic systemization of language, labour and behaviour. The aesthetic is post-minimalist with a focus on eloquent paradoxes of form and function, and their relationship to the notion of identity. 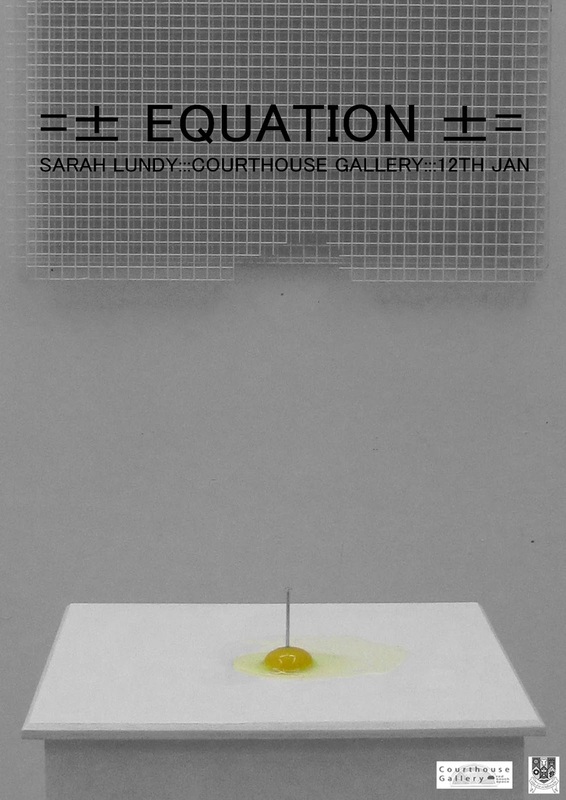 Lundy is a visual artist and curator based in county Clare. She holds a BA hons in Arts, English & Philosophy & MA 1st Hons in Arts Policy & Practice from NUI Galway, plus a distinction certificate in Professional Art Practice from GTI. Currently she is studying part-time for her MFA with the OCA & is Front of House Manager at Glor Arts Centre, Ennis, Clare and holds a voluntary position of administrator with GUAC. She has exhibited in selected group exhibitions in 126 Gallery, Galway, Catalyst Arts Belfast, Mad Art Gallery, Dublin, Carnegie Arts Centre, Kerry, Galway Arts Centre and Tactic Cork amongst others. Having completed a curatorial internship at The Model, Sligo recent curatorial projects include Void:Volume international group exhibition at Galway Arts Centre, November 2011 & Television group exhibition, Tactic, Cork in association with MART, September 2012.She was recently selected for a group screening at Riverbank Arts Centre, London at the Irish Film Festival, London, November 2012. Further video work can be seen at www.mart.ie.